Sarasota County Commissioner Charles Hines has shared with Sarasota Downtown Merchants Association (SDMA) members the latest county data showing that the majority of Emergency Medical Services (EMS) calls involving homeless people continue to originate in the City of Sarasota, he reported to his colleagues during their regular meeting on April 12 in Venice. Before they looked at the maps provided by Richard Collins, the county’s director of emergency services, Hines continued, they believed the EMS calls were more widely spread across the county. 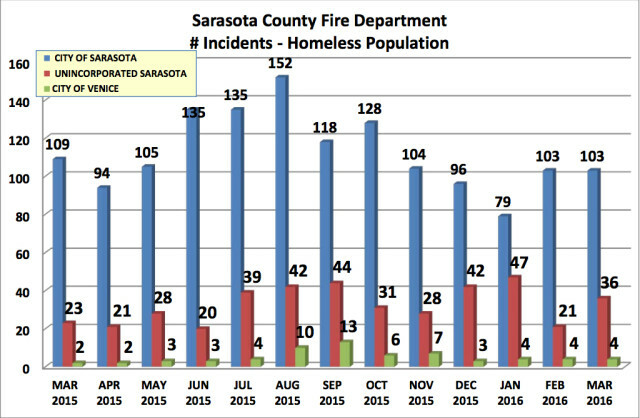 The March 2016 data — which Collins provided the commissioners on April 6 — showed that of the 143 calls the Sarasota County Fire Department received in March involving homeless individuals who needed medical attention, 103 originated in the City of Sarasota; 36 in unincorporated Sarasota County; and four in the City of Venice. 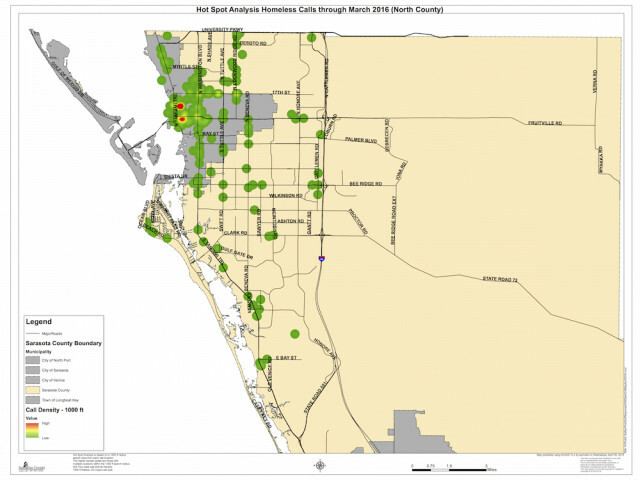 During March 2015, the data showed, 109 calls were recorded in the City of Sarasota; 23 in the unincorporated part of the county; and two in Venice. For the first quarter of this year, 401 calls have been logged: 285 in the City of Sarasota; 104 in the unincorporated county; and 12 in Venice. The information Collins provided says 86 percent of the homeless individuals whom EMS teams helped in March of this year were transported to a hospital; that represented 2.6 percent of the Fire Department’s total transport numbers. The number of calls for EMS transport of homeless individuals was up 6.7 percent in March 2016 compared to the same month in 2015, according to the report from Collins. Moreover, the report notes, 29 individuals requested EMS services more than once. People whom business owners have identified as vagrants come into stores and demand food, Hines pointed out. He also provided SDMA members information about county efforts to deal with the homelessness issues in the community, Hines added. They voiced a lot of interest in that material as well, he said. Hines is the second commissioner to meet with a group in the City of Sarasota to talk about how the County Commission is addressing homelessness matters. On Feb. 2 and again last week, County Commissioner Paul Caragiulo — a former city commissioner — attended the regular meeting of the Downtown Improvement District board, whose members work on measures to make downtown Sarasota a more attractive destination for residents and tourists. 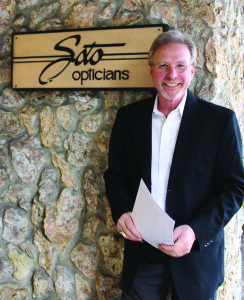 Ron Soto, owner of Soto’s Optical Boutique on Main Street in Sarasota and chair of the SDMA, told The Sarasota News Leader this week, “It was really nice” to have Hines attend the organization’s last meeting. 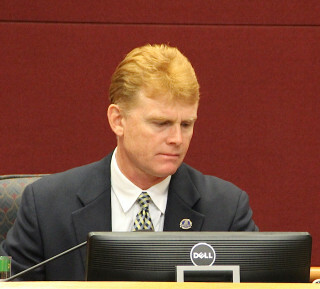 Although the County Commission has been unable to secure a site for a come-as-you-are shelter for homeless individuals, it has contributed to a number of other initiatives, as noted in a March 21 report to the board from Wayne R. Applebee, the county’s director of services for the homeless. 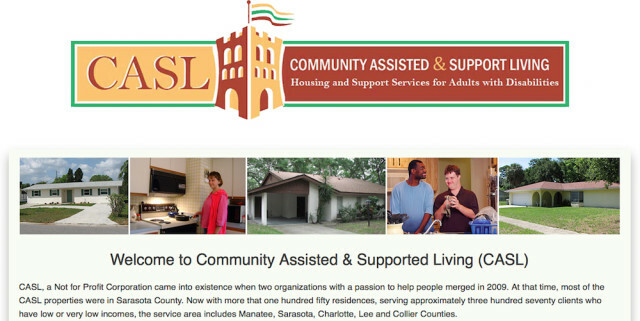 For example, Applebee wrote, the county has contributed funding to the Sheriff’s Housing Initiative Facilitating Transient Services (SHIFTS) program, which is a pilot project of the Sarasota County Sheriff’s Office and Community Assisted and Supported Living Inc. (CASL). SHIFTS, which has a total of 10 beds, has experienced a 74-percent success rate in housing homeless adults, Applebee added. Of the 38 participants in the program as of the latter part of March, Applebee noted, 12 were still living at CASL/Renaissance Manor in Sarasota and seven were in other housing. Moreover, of the 23 participants with prior criminal records — representing 392 charges and 285 arrests — only one of them has been arrested for a new criminal offense since entering the program. As part of the preparation of the county’s 2017 fiscal year budget, Applebee noted, staff will seek more funding for SHIFTS out of the $1 million the County Commission earmarked in the current fiscal year budget for a homeless shelter, which has remained unspent. 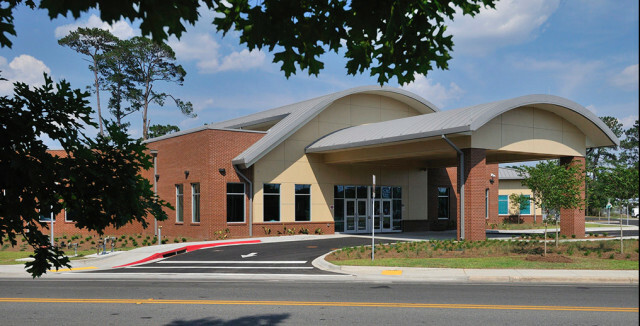 As for a shelter: Applebee reported that “staff recently visited a comprehensive 260-bed adult homeless facility in Tallahassee,” which opened in 2015. “The Kearney Center, operated by a nonprofit, was planned, located and opened by a group of private sector and community individuals,” Applebee added. “Leon County and the City of Tallahassee each pledged $100,000 for five years toward the $7.8 million in capital costs,” he noted. The facility is located near offices of other service providers for the homeless, as well as the county jail, Applebee continued in the report. It is in an industrial area that is 3.5 miles from the state Capitol and downtown Tallahassee. The nonprofit operator of the Kearney Center and local government officials, he wrote, have decided so far “not to utilize the shelter in lieu of enforcement of minor violations by homeless individuals.” However, law enforcement officers are allowed to drop off people at the facility 24 hours a day, seven days a week, including those released from the jail at midnight who have no homes to which to go, Applebee added. Staff has been discussing bringing the chairman of the board of the Kearney Center and its executive director to Sarasota County to make a presentation about the facility, he noted. “The hope is that the private sector may be able to succeed in designing, funding and operating a similar shelter,” Applebee added. Additionally, Applebee pointed out, the Office of Community and Housing Development in Sarasota County is at work on finalizing the next five-year Consolidated Plan for submission to the U.S. Department of Housing and Urban Development (HUD). That plan “re-prioritizes the needs for our community, many of which have been the focus of the County’s homelessness initiative,” Applebee wrote. The County and City of Sarasota commissions are scheduled to finalize that plan this summer for submission to HUD in August for its review and approval. (See the related story in this issue.) The plan is to go into effect at the start of the 2017 fiscal year, which is Oct. 1. It would be interesting to know how many of the 103 calls for EMT assistance for the homeless in Sarasota were from those arrested within the past week in other parts of the county and brought into Sarasota to the jail for one or more nights before needing a trip to the hospital in the city. While it’s anecdotal, several weeks ago there were several homeless men outside of the Fruitville and Washington Street Walgreens, sharing one shirt in order to be permitted to go into the store while waiting for a ride “back home to North Port” having been arrested the night before there, brought to the downtown jail in Sarasota and released. The lines were too long in the store, so I went home and brought them tee-shirts. They cheered because the front read “Neighborhood Crime Watch” and I told them it was time to join the other team.